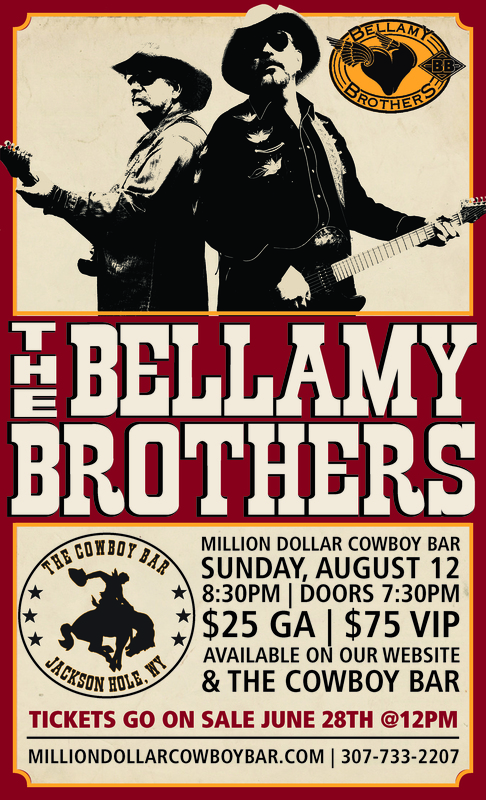 The Bellamy Brothers will perform on The Million Dollar Cowboy Bar stage on Sunday, August 12th. Doors open at 7:30pm, with The Bellamy Brothers going on at 8:30pm. Tickets will go on sale Thursday, June 28th at 12pm MST. $25 for General Admission and $75 for VIP. Please click the button below to purchase your ticket. Hard tickets are available for purchase at the Million Dollar Cowboy Bar. Please click here to purchase a ticket. The road that started on the pop music charts in the ‘70’s, took a winding turn into country music in the ‘80’s, paving the way for duos to come. But before the road forked into country, the musical odyssey of brothers Bellamy started creatively smoldering in their home state of Florida, before exploding nationally amidst the ’70’s pop music culture of L.A. Internationally, the story has been the same—though the titles may be different. The Bellamys have released more than two-dozen hit songs outside the U.S. that were never released here. Howard and David concur that their career is unique in their international finesse for matching their songs to the market.